One of the interesting modifications I have done to my 53 rag top is converting the instruments to 12 volt by using 58 C10 pick up gauges. Not only did the truck use 12 volt gauges but it also uses an electric temperature gauge. I thought they would almost be a bolt in since the looked so similar but not quite so. 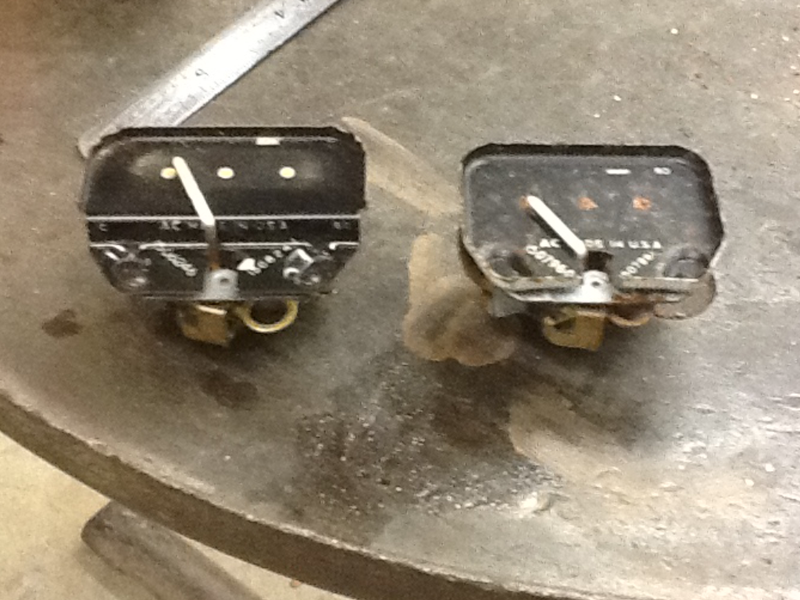 I started with my really rusty instrument cluster and this one from my parts car which was not so bad. My truck gauges came from Ebay. I think I gave 45 bucks for the truck cluster, sold the speedo and chrome bezel for 35 leaving me the 4 gauges for 10 bucks. Here is what made it more challenging than I expected. The truck gauges are 3/16" deeper than the 53-54 gauges. The electric temp gauge is more like 3/8" deeper. So here you see the challenge. I will post this and work on the next post showing how I chose to deal with it. It seamed to me it would be better to modify the housing rather than try to modify the gauges. If one of the gauges fails, I would like to e able to just install a new gauge and not ha e to worry about modifying it to fit. 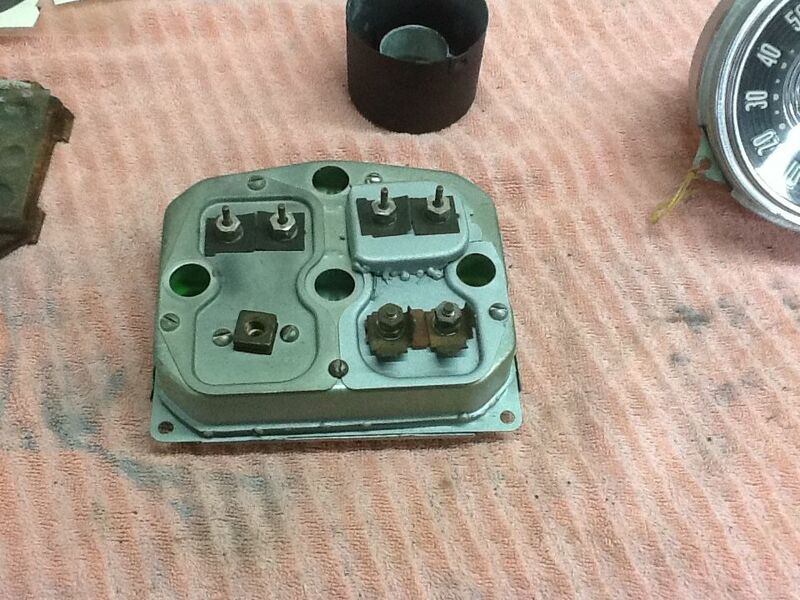 The housing comes apart simply by uncrimping the bezel. 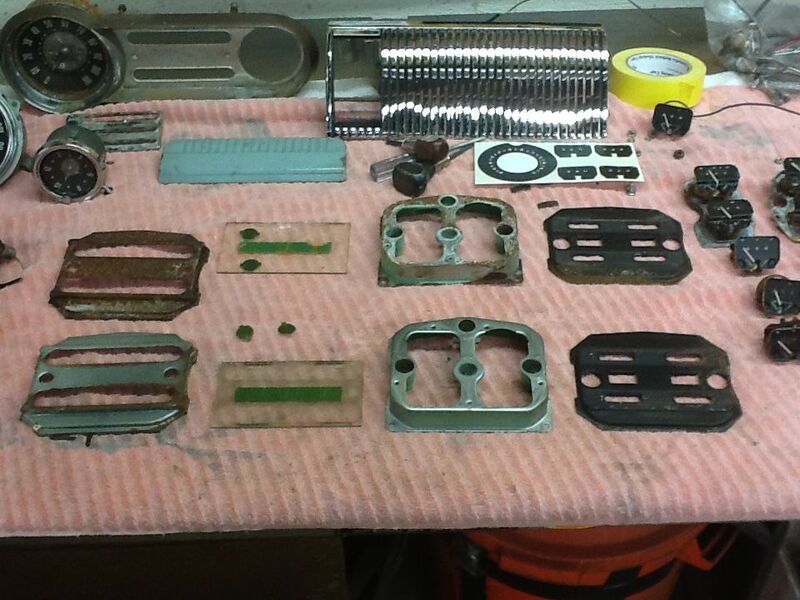 here you see the two housings taken apart and laid out on the work bench. My solution was to cut the lip off one housing and cut 3/16" off the second housing. 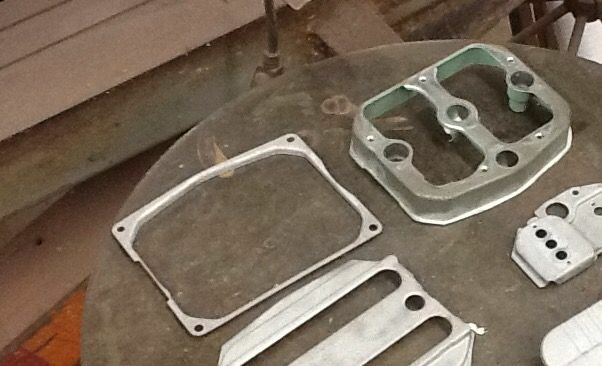 These were welded together resulting in one housing that was 3/16" deeper than stock. Here are the two pieces laid out. 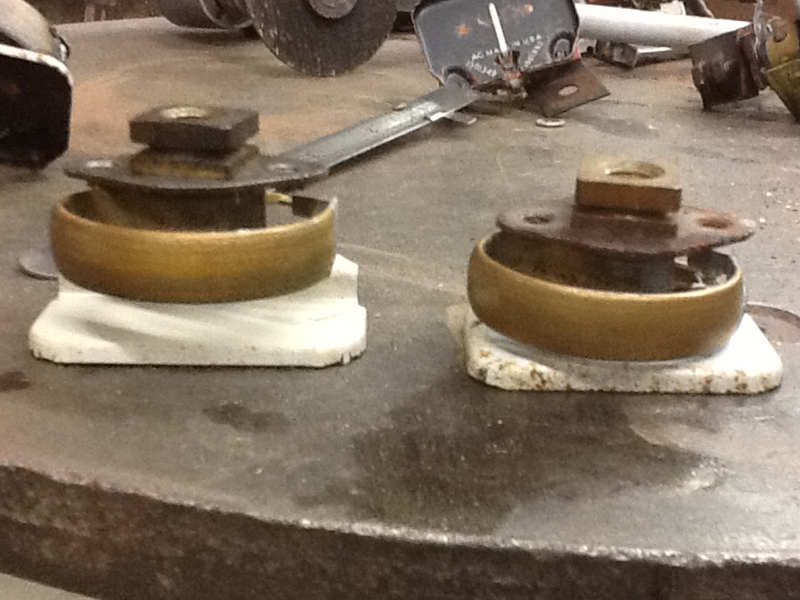 You can see the flange ready to be joined to the other housing. Here is the new housing after the teo pieces are mated to each other. Look closely and you can see the seam. The next item to deal with was the temp gauge which was deeper than the other things. I will be back with another post on how I mounted the temp gauge next. 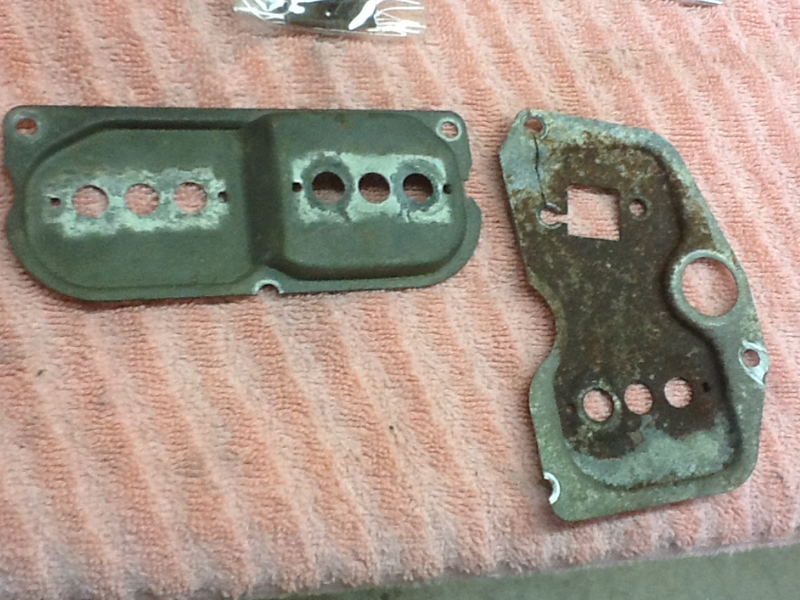 The mounting plate on the left is what the truck gauges used. They were mounted side by side above the speedo in the truck. The 53 gauges mount over and under as seen looking at the plate on the right. Notice the pocket on the left hand truck mounting plate. The solution to mounting the temp gauge was simply to cut that pocket out and weld it into the 53 mounting plate. You can see here how I mocked it up. What was left was to put new decals on the gauge faces ($9.95) paint the housing, buy new instrument cluster lense ($30 from Chevy's of the 40's) and paint the black mask. This leaves you with what appears to be a brand new stock instument cluster for somewhere around 70 bucks. So there you have it. One of those modifications no one will ever know you did......unless you tell them. I hope this helps someone out there who is looking for a gauge solution. Even if it makes them decide against this method, at least it has given them the knowledge to base their decision on. Personally, I enjoyed it and would definitely do it again. This is what hot rodding is all about. 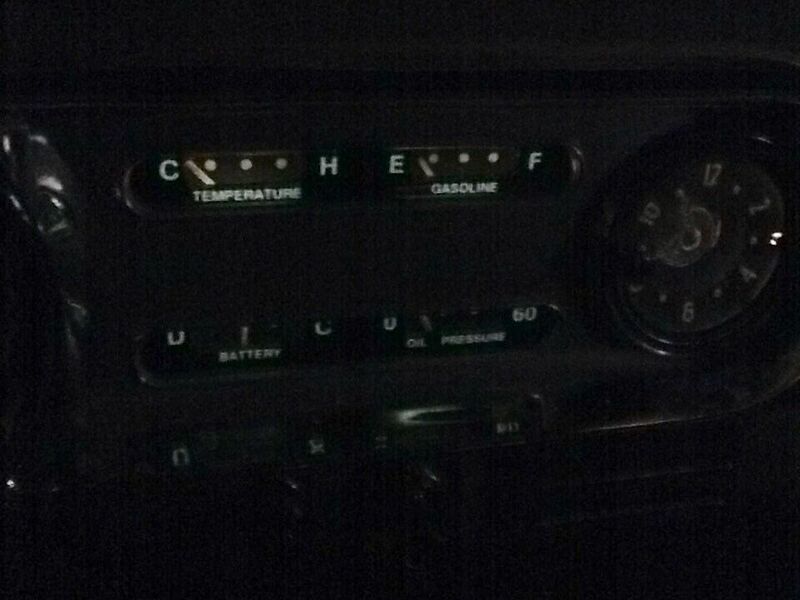 When I was restoring my '54 Chevy pickups I discovered that '55 to maybe '58 Chevy school buses had the same gauges except the temp was 12V electrical instead of mechanical and the gas gauge was already 12V. Saved me a bunch of work. Good job 40-Grit! That is outstandingly EXCELLENT work! Us old guys are dying off at an alarming rate, and no one seems to care that we are taking the hard earned knowledge, and ingenuity with us. If they can't google it, or text it, it ain't important. Really nice work, and I like the fact that you crawled around under dashboards enough to think of a solution to your needs. Most people would have put a Dakota Instruments dash in it. Hi John, that dash looks sweet with the chrome and reworked gauges. There is a lot of truth to what you say Griff. Unfortunately, it is also getting harder to crawl around the junk yard to find something that will suit your needs. Thank goodness for Ebay. I am definitely not a restorer. 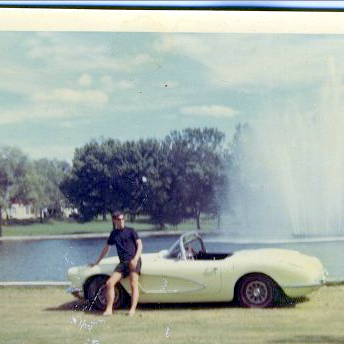 I like to do my own thing and enjoy building a car that is as comfortable on the interstate as it is in town. One of the things I don't like however is an ultra modern dash in an old car. 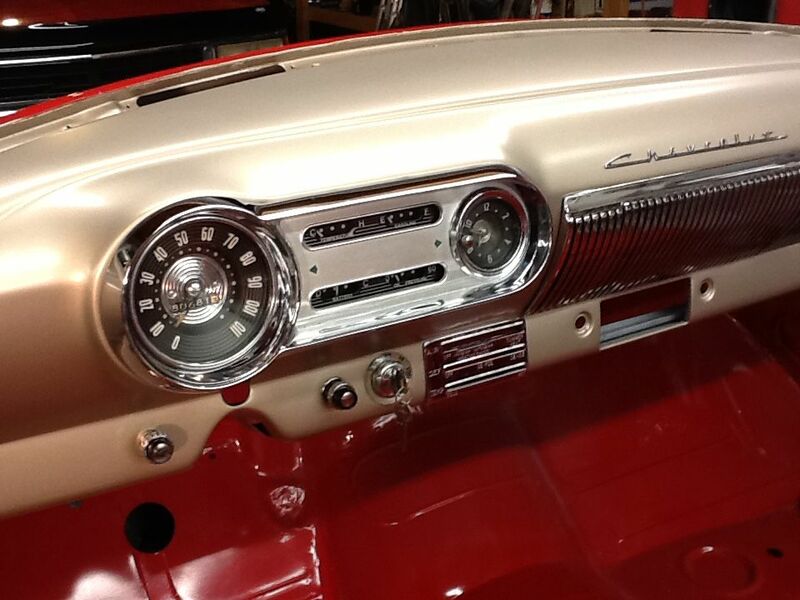 So much of the personality of these old cars lies in the style of the dash boards. Keeping the dash stock looking is just one of the challenges I enjoy. One of my up and coming challenges will be to install an A/C system keeping the controls looking stock. LOL, We'll see how that one goes huh? I think what makes customs and hot rods so much fun is no two are alike. We each get to do our own thing. Even though the next guy may not do it the way I think it should be done at least it will be different and interesting. Edited by 40grit on 10-23-18 02:34 PM. Reason for edit: No reason given. 1948 Chevy Fleetmaster Coupe Purchased 6/2010. Stock with rebuilt 52 216 installed May 1966. 1946 Chevy 1/2 ton pickup, stock. Purchased 11/18/17. 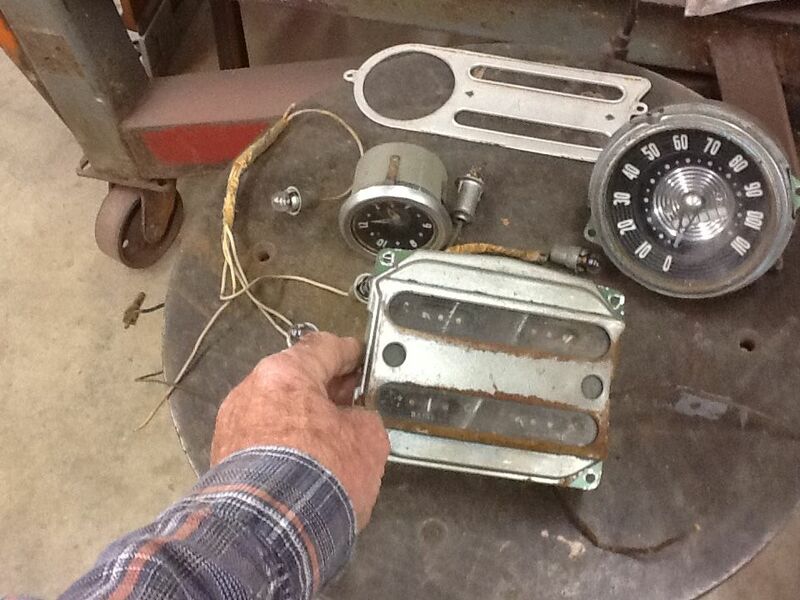 John, thank you for sharing the gauge modification info. Your fabrication skills are truly impressive, even better than I have seen in some car magazines. In addition to that, your descriptive write-up is thoroughly detailed, easy to understand, and clearly illustrated by the accompanying pics. Repeating what I said in your earlier thread, the finished result looks so good that nobody will believe it didn't come from GM. This thread contains so much valuable info that I think it should go into the sticky section. Unless you have any objections, I will ask the moderator to move it there. By all means. I am flattered you might think it was worthy. Totally agree with Raycow. I love modifications like yours —using same era parts to make a difference, yet no one would ever spot the change. Great job! I don't know much about the pickups. Is that an original color? The parts you used seem to match my '54: surf and Burmuda green. You are correct. The truck and 53-54 gauges look almost identical. 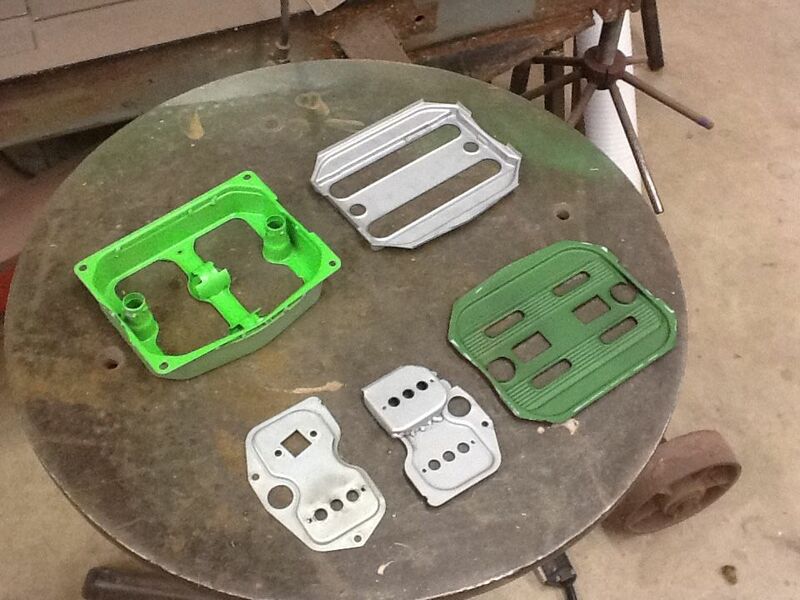 "Your fabrication skills are truly impressive, even better than I have seen in some car magazines. In addition to that, your descriptive write-up is thoroughly detailed, easy to understand, and clearly illustrated by the accompanying pics. Repeating what I said in your earlier thread, the finished result looks so good that nobody will believe it didn't come from GM." The quote above from Raycow says it all. You and I are the same age (I'll be 74 in November) and I think that is what separates us from others who would never consider doing what you did. We're from an era when boys were able to take shop classes in junior high and in high school. That made it clear to us that actually doing stuff is completely normal. There was a shop that built Indy 500 race cars in the 1950s right across the street from my elementary school. I saw Indy chassis laid out in chalk on the shop floor. I was allowed to stand there and watch in the afternoon after school as long as I stayed out of the way and didn't ask too many questions. Those days are long gone. Now leafing through car magazines will show you that you can get anything imaginable delivered to your front door without ever lifting a finger. Anyway I'm sure that all the grayheads on this forum are thinking what Raycow wrote and the youngsters are thinking "Why did he do all that work when he could have bought new digital gauges?"